Great information and helpful for a beginner like me. Very useful information I'm pretty sure you've used market samurai also ,could you please tell me how do you calculate KEI,KOI,KFI base on market samurai data and also , what is the difference between C (competition) and P ( popularity ) which "Nikolay Gachev" mentioned on his post for the KOI formula and what are the equivalent of the C and P for market samurai data ? As far as I know Link-Assistant.Com are going to add some of these advanced operators into Rank Tracker to increase the keyword research power of the tool. By putting double quotes around a set of words, you are telling Google to consider the exact words in that exact order without any change. Google already uses the order and the fact that the words are together as a very strong signal and will stray from it only for a good reason, so quotes are usually unnecessary. By insisting on phrase search you might be missing good results accidentally. For example, a search for [ "Alexander Bell" ] (with quotes) will miss the pages that refer to Alexander G. Bell." Thank you and all the contributors for a great thread. I have a question relating to Keyword selection as indicated by the KEI number. I used Rank Tracker on a customers website who is in the freight fowarding and logistics business,their website only had 7 pages and the home page only featured 5 keyword, so it was quite easy to build a large list using RT as adviced. However when RT did the keyword research (Exact Match) the keyword with the largest KEI number (By absolute miles) was Logistics, which was also a highly relevent keyword to this site. This indicated to me that if I could optimise a website for this keyword and get to Google number 1 organic position I would get lots and lots of targeted traffic...! However when I searched in Google for the websites the currently occupy the first 3 organic positons for the keyword Logistics, it did not look so easy to do...! 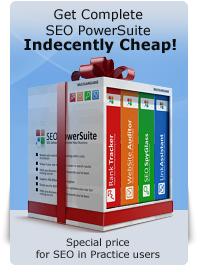 So my question is, what else do I need to do to select the right keywords to get to #1 in Google organic searches, using the tools within SEO Powersuite? A keyword can have a very good KEI score but be REALLY competitive, like in your case. With "logsitics" the high KEI score means that getting on top for this keyword will require a huge budget, but the traffic revenues you will get will be huge as well. So you take a longer-tail keyword that will have less competition it will be more realistic in terms of achieving top ranks for those keywords. A highly competitive keyword such as "Logstics" would definitely be hard to compete for so there is always an option to pick longer-tail less competitive keywords. Thank you for your quick response to my question, however I feel you side stepped the answer some what! My question was "what else do I need to do to select the right keywords to get to #1 in Google organic searches, using the tools within SEO Powersuite?" Because I see that a high KEI only really indicates the potential for higher traffic than any of the other keywords in ones list, which is a good starting point but obviously not enough to conclusively select a keyword to build a web page around. If I plumb for a "longer tail keyword" which would have a lower KEI and potentially lower traffic but the traffic would most likely to be more targeted with a better conversation rate per visitor...??? 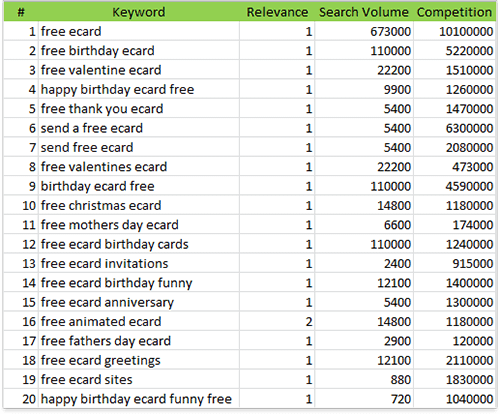 However this still does not help me decide which are the the best long tail keywords to select from my list. I feel there is something missing that perhaps one of the other SEO Powersuite modules could help make this keyword selection more conclusive! Or perhaps the next step would be to dig deeper by selecting the higest ranking KEI, relevent Long tail keyword from the list and create a new related list to perhaps find those long tail keyword gems .. What do you think? > If I plumb for a "longer tail keyword" which would have a lower KEI and potentially lower traffic but the traffic would most likely to be more targeted with a better conversation rate per visitor...??? That's what usually happens, yes. > However this still does not help me decide which are the the best long tail keywords to select from my list. I feel there is something missing that perhaps one of the other SEO Powersuite modules could help make this keyword selection more conclusive! The best thing you could do is compare the competition' strength by comparing not only the competition quantity, but the value of their backlinks. You can do that by taking some 5-6 top competitors for each keyword and creating multiple projects in SEO SpyGlass for them, to see how many high-value backlinks they have. Also you can check the number of sites really optimized for the keywords using the "allintitle" and "allinurl" search operators (they are not in Rank Tracker yet, but will be added soon AFAIK). this method is wrong and crappy. It seems that's easy so to rank with the keyword "flash games". The truth is that it's impossible because there are many (very very) strong competitors using this keyword. So, this parameter is very useless and crappy. What you need is the number of results that you get by using that command on Google - and it is 1.560.000, that's your direct competition, pages that have "flash games" in their title. That is A LOT and, just as you said, it would be REALLY hard to get on top for that keyword. If you get around 10K results for your "intitle:keyword" operator that would be doable. That is why I suggested finding longer-tail keywords above there. Is it a good idea to choose keywords which primarily are in our domain name? Rather, the other way around - it's good to have your main keywords in your domain name, yes. Dan, can you outline a strategy to decide between keywords that have a high KEI, but are not very specific to our business, vs. doing it the other way? 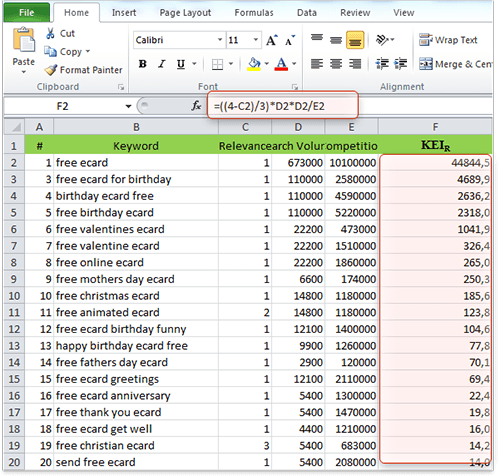 Even your weighted formula wouldn’t make much difference, since the difference between potential keywords is so big, e.g. programming (1000000), integration (133000), middleware (5600), IT consulting (1600), SOA architect (64), SOA consulting (9). What about keywords that have several meanings, e.g. SOAP – most people know it as a cleaning product, but it is also a computer term, so how would you determine the "real" KEI? Strangely enough, the computer related term has the most results on the first couple SERPs. Hey Dan, thanks for this great resource. When you update this section, don't forget to include that WordTracker is now reporting search volumes based on YEARLY searches as opposed to the former daily search volume numbers. Honestly, I don't rely on the WT tool very much. After they changed from daily to yearly search volumes, I used a keyword that had 3000 DAILY searches in January 2009 and found that the same keyword had slightly over 3000 YEARLY searches in April 2010. I just can't see how there could be such a huge discrepancy. So I've concluded that WT is really just garbage. Maybe not exactly "garbage" but Google AdWords Keyword Tool is more preferable. Since this chapter was written Google AdWords Keyword tool has been added to Rank Tracker. This article was Excellent and helped me a lot in writing my article on D-A-D . The only thing I was wondering why din't you considered KOI over KEI ? As far as I know Link-Assistant.com are going to add the "allintitle" and "allinurls" parameters in the keyword research section of Rank Tracker at some point in the future. Nice to see someone else factors in the relevance of a phrase. When working with businesses its no good finding "great" phrases when they don't relate to the market you are in. I personally called it "conversion rate", as in the chance that it would create a lead/sale, and I score it out of 10. Another variation is that I change the power used in the search volume, based on how competitive my clients website is (e.g via PageRank). I also play will several other stats and formulas (like KER which is a logarithmic variation). I mix and match them. They are only clues which a good SEO detective should use to find the jems in the stones. I like those surprises. My last client got very excited when I was asking about certain searches that were popular, but had little competition. They were new products, which he was thinking about stocking. No brainer now! I also check out Google Webmaster Tools for hints on keywords.